With government funded space flight taking a hit lately, Seattle billionaire and Microsoft co-founder Paul Allen has stepped in with a pioneering vision for commercial space travel. 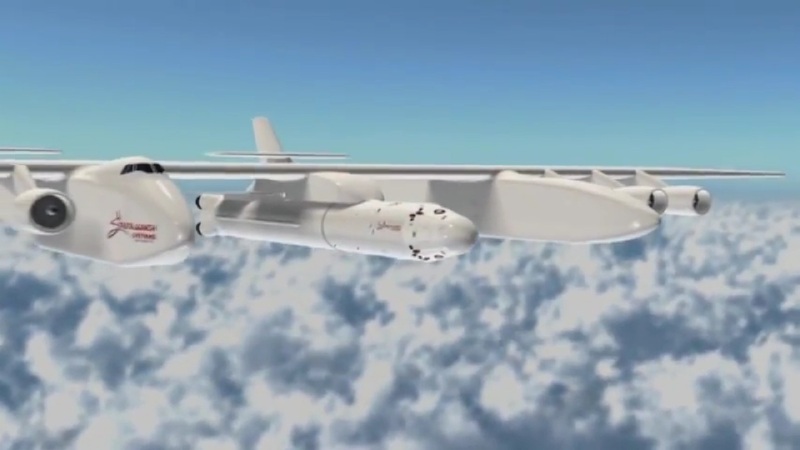 Allen, on Tuesday, unveiled designs for an efficient air-launch system that resembled a giant airplane split into two fuselages. The craft will take both government and commercial payloads into orbit, with human missions as an eventual goal. Though one might be tempted to compare the giant craft to Howard Hughes’ failed Spruce Goose, Allen’s aircraft is much larger. The billionaire is also no stranger to spaceflight. Allen funded the development of SpaceShipOne, the first manned private spaceflight. “I have long dreamed about taking the next big step in private space flight after the success of SpaceShipOne – to offer a flexible, orbital space delivery system,” Paul Allen stated at a press event in Seattle. As far as specs go, the aircraft carrier will have an enormous wingspan of 385 feet and will have a gross weight of 1.2 million pounds – it may just be the largest aircraft ever to fly. The carrier will use six Boeing 747 engines and will be able to fly 1,300 nautical miles. The size of the craft’s runway will need to be 12,000 feet long. The goal is for the Stratolaunch craft to have a first flight within five years. The manufacturing of the aircraft is broken into three primary components. First, is the carrier aircraft which will be manufactured by the Rutan-founded Scaled Composites. The multi-stage booster will be taken care of by Elon Musk’s California-based Space Exploration Technologies. Finally, the coupling system that allows the carrier aircraft to hold the booster will be built by the aerospace engineering company Dynetics. After NASA’s last space shuttle launch, private funding may be just what space travel needs to get us to Kepler-22b.